Before attaching the neck to the body of the mandola, I needed to lay the frets. There are a few distinctions here I want to make before getting into the process. First, the slots for the frets were already cut in the ebony, as I do not know enough about guitar harmonics to do this accurately myself. 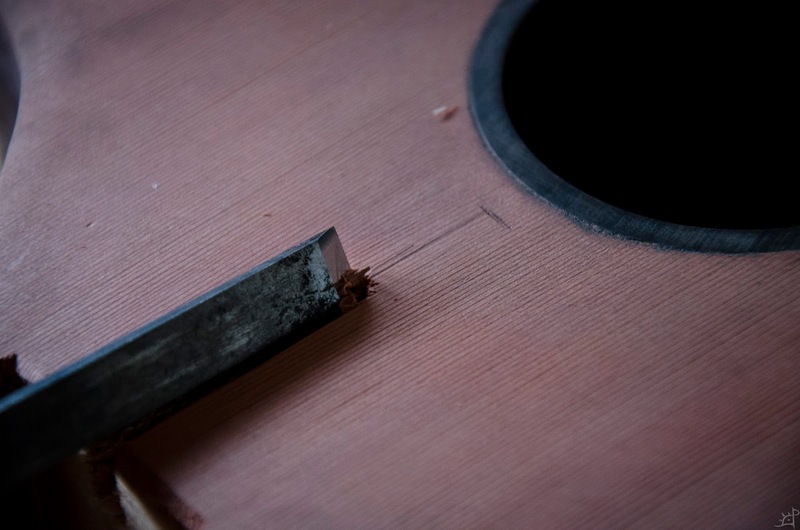 Also, I do not have an accurate means of cutting those slots to the necessary width to accept the fret wire. Second, I left the face flat instead of crowning it slightly like is often done on fretboards. 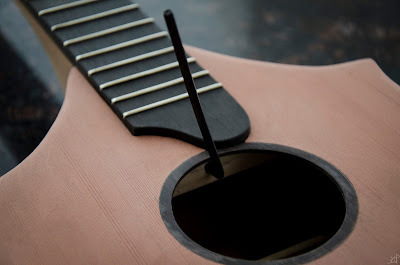 Were I to do this again, I would make the surface convex, as it makes for an easier time playing the instrument by putting more apparent distance between the strings when pressing on the strings between frets. 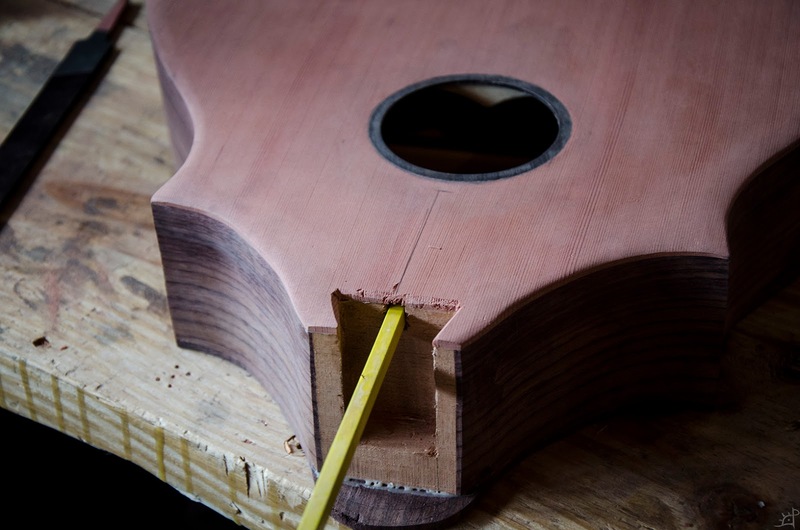 In order to fit the neck and fretboard to the body, the top needs first to be attached. 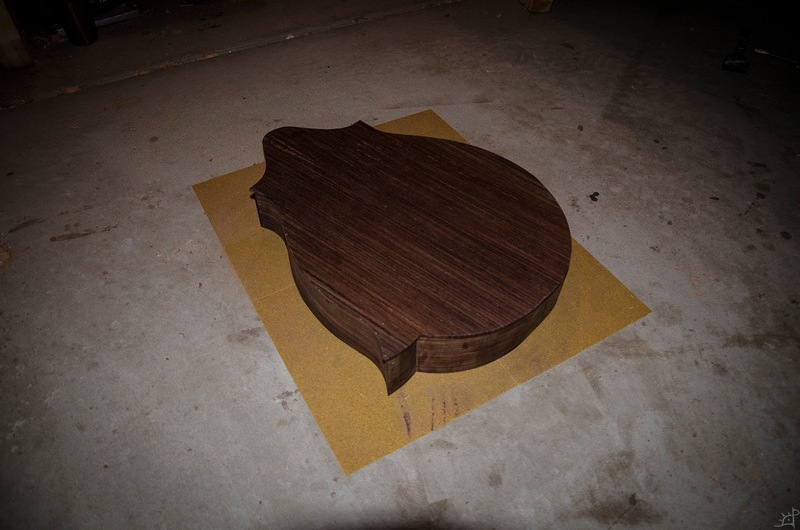 Like with the back, I used the flat surface of my old garage to sand the sides plane. Then, same as before, I clamped and weighted the top for the glue to dry, careful of avoiding the mistakes of the previous evolution that resulted in the crushed fibres that needed to be repaired. Distribution of pressure along the entire parameter is especially important, so I adjusted the weights and placement until there was even squeeze out along the entire joint. 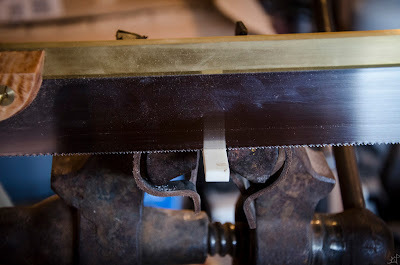 After the glue dried, I used the coping saw to trim away the excess. This is where I began to encounter problems with the cedar. It being a particularly splintery wood, there was a considerable amount of tearout on the back side, which, because of the configuration needed to see where I was cutting, was the top face. Had I been thinking more clearly, I would have left a significant margin around the edge instead of following so closely to the sides. 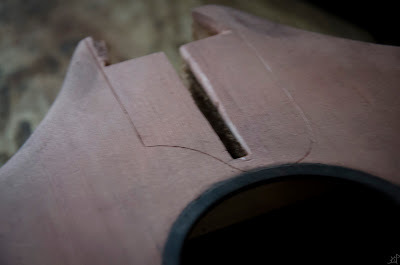 Once I noticed the problem, I corrected for it, but there was a bit of damage that needed to be carefully sanded away. Another problem with the cedar was its tendency to break on the corners. Specifically, on the lower point it broke off, which I patched, only to have it break again. The glue is far stronger then the natural wood fibres, so it was difficult to cut cleanly. In the end, there was a few small chips that I could not fix, but overall taught me a valuable lesson. Now then, I am able to fit the fretboard to the body. 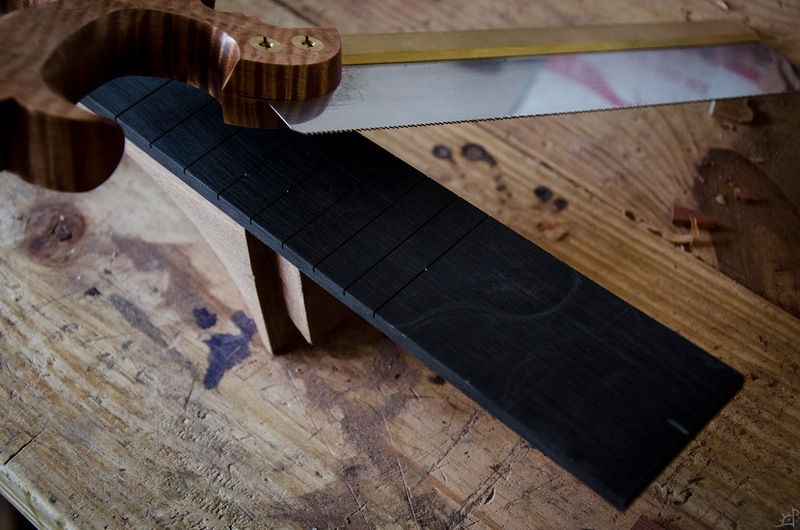 The fretboard is longer by a fair bit than it needs to be, allowing for my shaping to whichever form I desire. The first step in fitting it to the body is cutting the slot in the top to accept the neck. 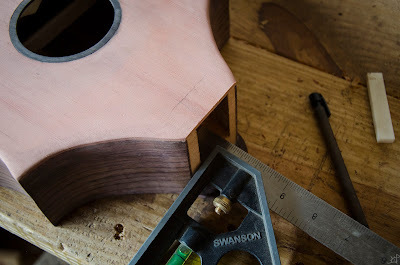 Most of the surrounding wood will later be routed away to make space for the fretboard, but I wanted to cut as close to the existing slot as possible to avoid complications. Next, a slot needs to be cut for the truss rod. 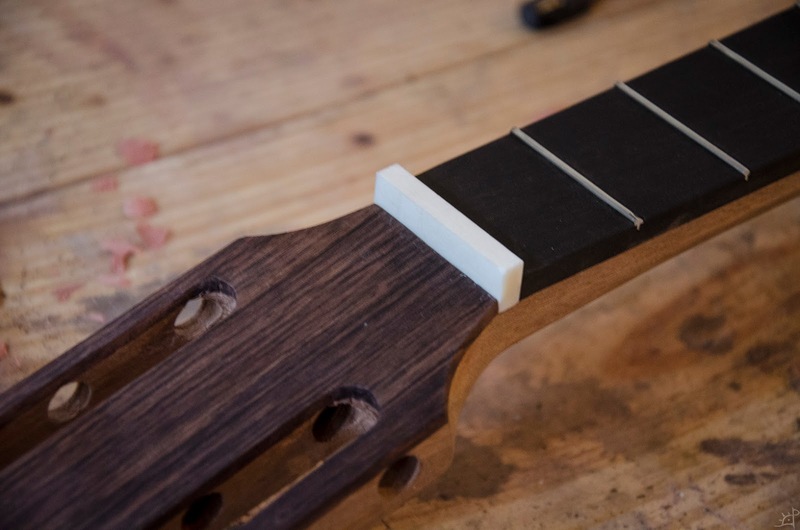 Underneath the top, the neck block extends nearly the exact same length of the overhanging truss rod, which is a happy coincidence. Without having it in the early stages of design, it was impossible to measure. 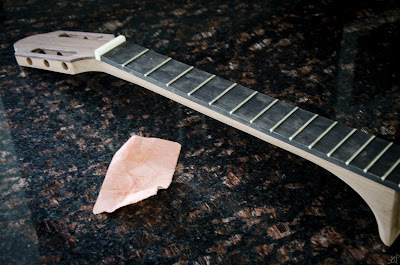 Had the truss rod been longer than the neck block, there would be problems with tension being put in dangerous places, likely resulting in some sort of delamination or other catastrophic failure. In order to align the necessary hole in the cedar, I used the other scavenged truss rod from a few months prior. 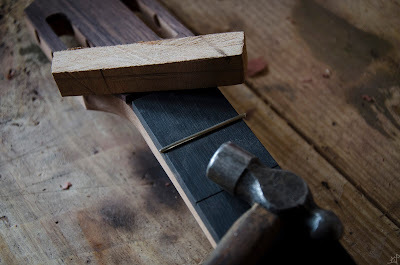 Realistically, I needed only to find a single line that lying entirely within the existing slot in the neck block, then widening it with chisels to the previously defined shoulders. Which is, more or less, precisely what I did. With that channel for the truss rod, the neck slides cleanly into place. 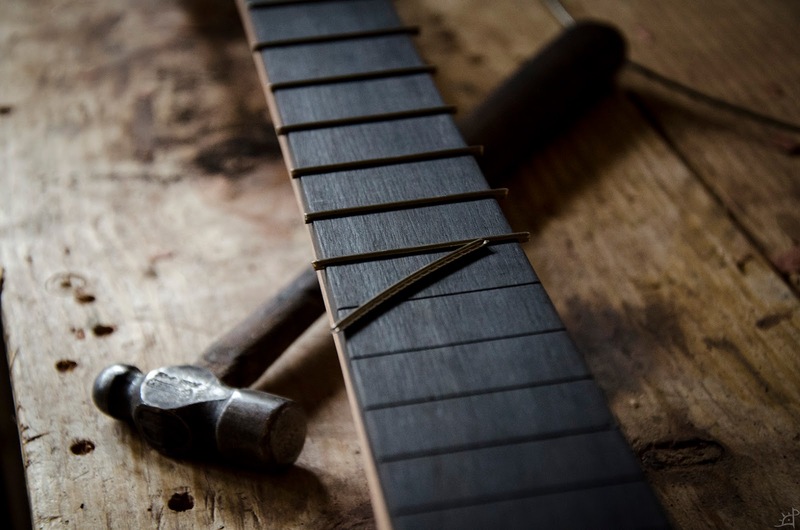 As shown above, the fretboard is considerably longer than it needs to be. After a bit of design and deliberation, I decided on a basic compound curve. It is important to note that this absolutely needs to cover the end of the truss rod in its entirety, as there is a clear and obvious slot cut in the top that would otherwise sit exposed without the fretboard to cover it. 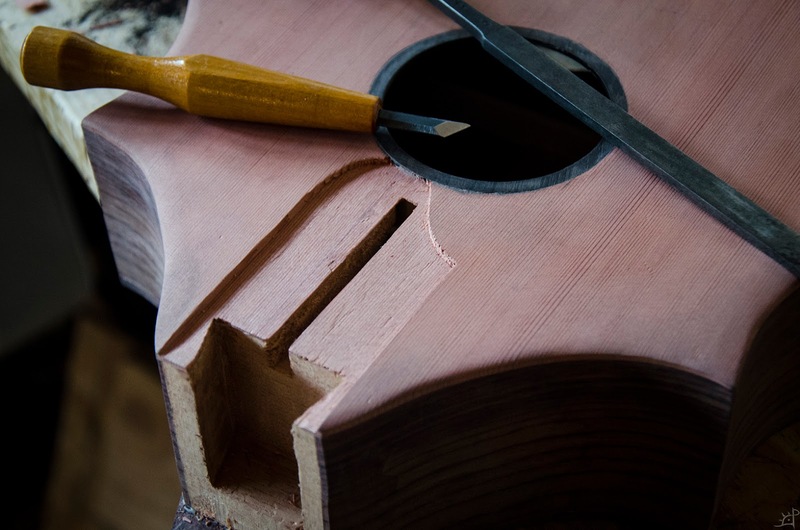 A bit of shaping later, and the fretboard can then be traced onto the body. Looking back, I probably would not do it this way again without some other design changes. For one, I had to remove a small bit of material from the rosette, which in a humidity swing caused it to crack. Second, getting the fretboard to inlet in the body perfectly was more trouble than it was worth. And finally, the most significant of the three, it lowered the fretboard closer to the body. 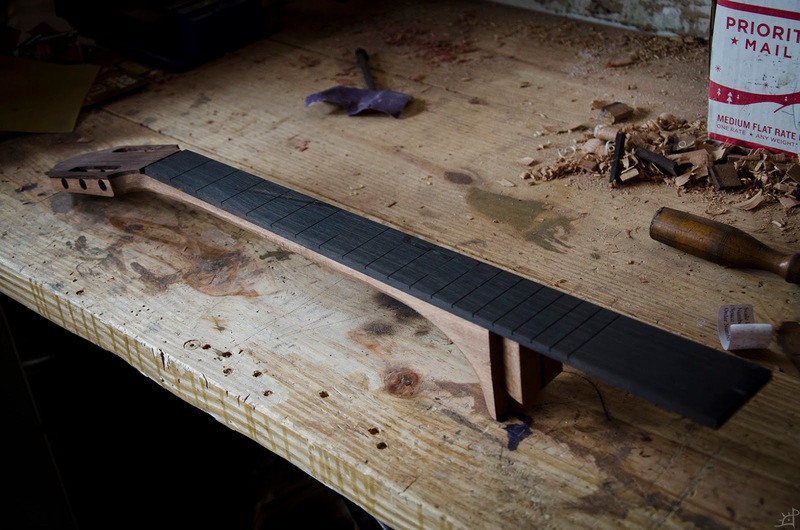 I did not account enough for a downward angle of the neck, so (looking several months into the future from when I did this) the bridge causes the strings to sit a bit too high above the body end of the fretboard. You may be thinking that I could simply lower the hight of the bridge, but that is not the case. The way I designed for the tailpiece, it sits on the heel of the body rather than being anchored in the centre of the top. 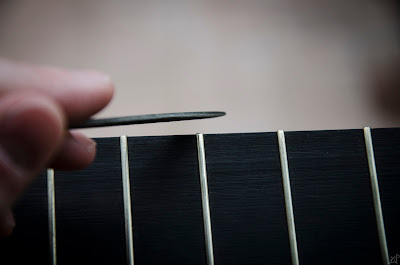 That causes the strings to be anchored higher than the surface of the top, so a certain height of the bridge is needed for sufficient tension across it to prevent the strings from rattling. Now then, between a handful of chisels, the slot is routed. 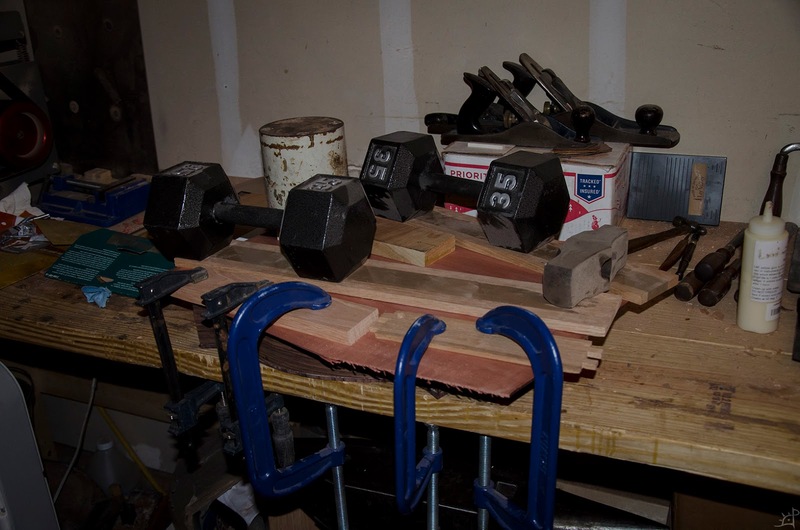 This would have been an excellent application for the router plane, but by this time it was already packed for the 3000 mile relocation west. 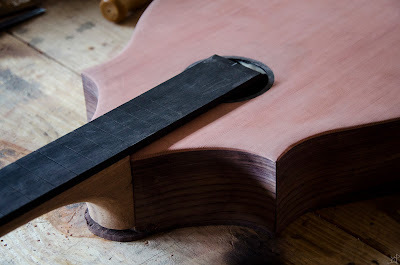 Returning to the beginning of this post, the neck is finally ready for its frets. 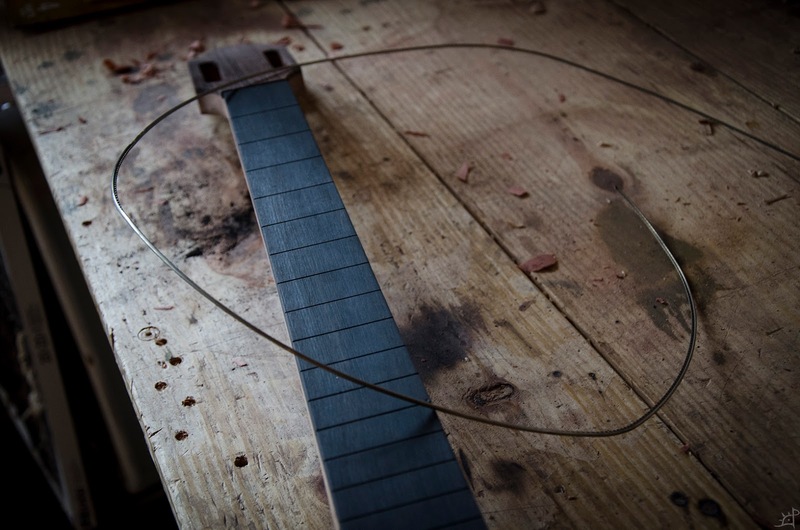 Fret wire is exactly as it sounds, a wire in the shape of a fret. Due to its coming in a coil, it would have been a bit easier to lay on a slightly rounded neck, but as previously addressed, I left it flat. 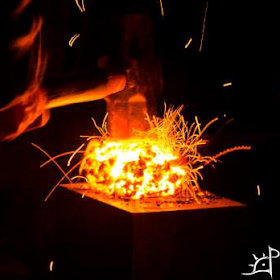 Without any information or guidance on how to do this, the best method I arrived at was to cut the wire to length, press it in as firmly as I could with my fingers, and hammer down on a block of wood to set it in place (having ample support directly underneath the neck while doing this). A few things I learned in this process- One, the frets very easily deflect to one side if not careful to use direct downward blows from the hammer and alignment of the wooden block. Once it begins to twist or deflect, there is not much that can be done to fix it without taking it out and sometimes scrapping that bit of wire altogether. Also, ebony splinters very easily. In many places the vertical edge of the wire began to lift splinters as it was driven in. 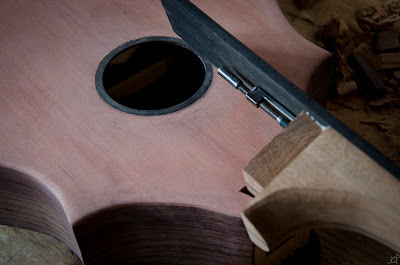 Fortunately, 99% of this was held down again by the inner corners of the fret as it fully seated. 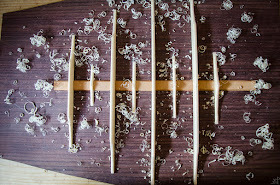 After a few hours of cutting and hammering, the last of the frets were in place and the neck was ready for the upper nut. I could have put this in at any time I suppose. This nut, which holds the strings near the tuning pegs, is historically made of bone or other natural material like antler or horn, but mine is some synthetic material that cuts like a hard wood and carves like stone. Grossly oversized, the nut protrudes a significant amount above the fretboard, which is fine until I am able to string it. I would much rather have to work it down a bit than realize too late that it is too short. 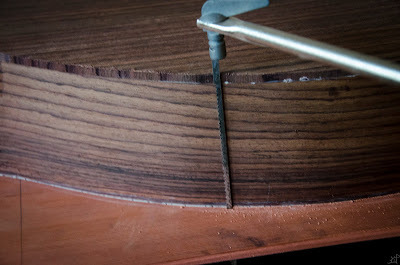 Before setting the neck in the body for the final time, I took a moment to file down the edges of the frets. The burrs from cutting and sanding were sharp in places, and the hard corners needed to have a nice chamfer. Then, a little more sanding in those hard to reach places before the opportunity passes. 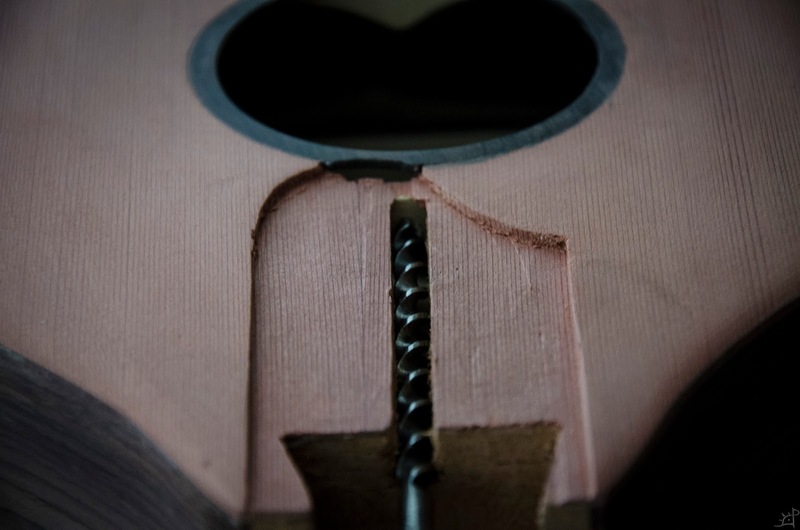 And finally, a hole needs to be drilled through the brace on the top so the truss rod can actually be adjusted. With the truss rod channel as a guide and a long brace auger, the task was fairly straightforward. And there it is, all assembled. You can see why that hole is necessary with the wrench in place. 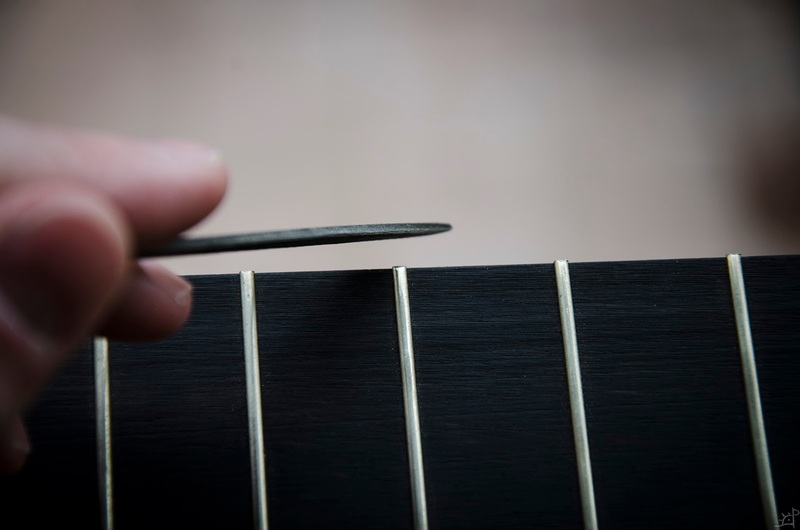 By twisting and untwisting, the truss rod adjusts tension and subsequently its pressure on the neck, allowing it to bend up or down slightly to compensate changes in humidity and string tension. I believe that the neck is glued in place here, but I did not take any pictures of that. With the joint already so tight, it was simple and unexciting. Next time, the body receives perfling and begins the finishing process.